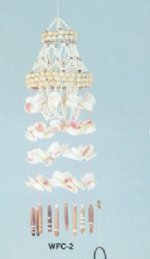 Our Products: Windchimes - Seashell Wind Chimes Wholesale > Medium Shell Wind Chimes 20" to 30"
Wholesale medium seashell windchimes from 20 to 30 inches in length, made out of cockle shells, nassarius shells, ringtop cowrie shells, sun and moon shells, capiz shells, sea urchin spines and other natural shells are a profitable retail item for beach gift shops. 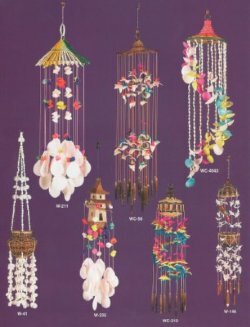 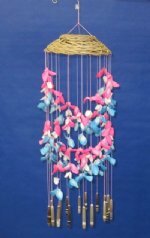 If you are looking for medium shell wind chimes, or shell chimes for coastal home decorating or tropical decor, nautical decor or seashell decor, we have a wide selection to choose from. 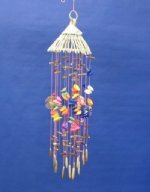 We also have medium seashell spiral wind chimes, colorful wind chimes, wind chimes made with natural shells and dyed shells and shell outdoor wind chimes and indoor wind chimes made out of dyed seashells and other pretty shells, cut shells and small clam shells. 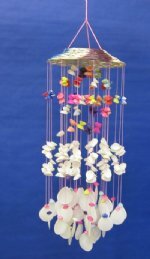 All our medium size shell chimes are hand crafted so you can expect a slight variation in the size of each chime.